Manhole covers: People walk with their eyes downcast, not because of eye contact avoidance, but rather to avoid stepping into open manholes as they walk along the sidewalk. Why no covers? Stolen for resale. Trash trucks – the musical: Remember the inane tune from your childhood announcing a Jack n’ Jill ice cream truck’s arrival of a summer’s evening? Here, trash trucks incessantly play nearly the same tune; upon closer inspection, the red-circle sticker on the trucks turns out to be a Japanese flag, in which is written: a gift of Japan. Why did the chicken cross the road? Crossing the street and driving are competitive sports because: There are no stop signs, and few lights, and those lights that there are, are not observed in the traditional green=go, red=stop manner, particularly the pedestrian lights. People jaywalk, stepping boldly into heart-wrenching heavy traffic, lurching across a lane at a time, hoping the driver sees them and slows down or swerves. As an auto passenger, the near-misses and chaos at intersections reduces me to a whimper, but drivers here take it in stride, by very, very aggressively backing up, around and through in ever direction. This is embarrassing: Several times, Doug’s turned around only to find me cringing on the sidewalk; holding his arm, as if we were out strolling, doesn’t help, because I invariably let it go when the going gets scary and he invariably plunges on. Of course, one has to cross the street eventually, so I do, but it’s a constant challenge. Yesterday I couldn’t help but smile at a man wearing a traditional nomad’s del coming towards me as he took one last long striding leap and made the sidewalk; the triumphal smile we exchanged reduced to insignificance any cultural differences – he’d made it across the street! Then it was my turn. Yes, there are zebra stripes, but their significance hasn’t reached all drivers, so some stop, and some don’t. I usually resort to waiting for other people, then positioning myself away from the oncoming traffic. They probably know what we foreigners are up to, but this practice does provide a little security, and that’s all it is, a little. When we arrived, every time I went to our Max Supermarket, I had a minder who followed me around to make sure I didn’t steal anything, even though they made sure my backpack was placed in a locker at the entrance. I’m not sure when things changed, but now I wear the backpack on my back and walk around looking at and for things on the shelves, and I have no minder. The produce clerk is especially friendly, sometimes rejecting what I’ve selected in favor of what she thinks is better or fresher, which I appreciate, and the checkout counter ladies have gotten used to my bringing my own bags. We exchange greetings in Mongolian, which is about all I’ve managed to pick up, but it goes a long way. I feel at home there now. We had minders in Bulgaria and in the Philippines, although, strangely enough, not in Russia. O yes, I remember now, the stores in Ekaterinburg had armed guards, so no need for minders. How do you know a recipe was not written by a Mongolian? If the recipe calls for lamb, it was not. Slaughtering a young animal, particularly a lamb, is considered callous and unethical. Mongolians prefer to eat mutton. I don’t, if I can help it. This information was conveyed during an English language discussion of Mongolian culture and customs. Some of you are wondering: What is Doug actually doing? A lot, it turns out, but perhaps poorly publicized because he has no time or energy to write in the blog, and I am on the periphery of his work. I decided to let his emails to the American Bar Assn staff in Washington about his work speak for themselves. I do know he’s come up with a murder defense in connection with a human trafficking case that hasn’t been used in Mongolia before, and which, since the following email was written, has resulted in the trial’s adjournment while the judge considers this defense and has the victim examined by a psychiatrist, which Doug advised the advocate to propose during the hearing. Some legal background: Mongolian legal procedure and law are similar to the systems in Germany and Russia (and the former Soviet Union) in which the object is to discover exactly what happened, so the judge can decide guilt or innocence, rather than to rely on (British and American) adversarial systems which depend on advocates’ argumentative skills to determine the “truth” by deciding who wins. The defendant, a 17 year old girl, had been forced to work as a street prostitute for the 2 years before participating in the murder of a co-worker for which she is being tried. While in school, a gang of fellow students, led by an older woman, recruited girls by force and threats to engage in evening and weekend street prostitution under conditions of trafficking. The defendant alleges that she was regularly beaten and threatened with worse if she refused to work or revealed her activities to her parents or others. After two years of this treatment the leader directed the defendant and other girls similarly situated to murder another young girl in the gang because the leader suspected the young girl of a romantic involvement with her boyfriend. The defendant admitted her involvement (holding one of the victim’s arms while she was strangled by the leader). The others, including the leader and her boyfriend, deny any involvement. 22.1. A person who at the time of committing a crime was in state of non-imputability, i.e, was unable to realize the socially dangerous nature of his/her act or omission or to control it shall not be subject to criminal liability. The court shall apply to such a person a compulsory measure of medical character specified in this Code. The argument is that the treatment the defendant suffered at the hands of the leader for the two years prior to the murder, together with the threats against her for disobedience, made her psychologically incapable of refusing to obey. We are trying to get the court to return the case for further investigation, including a psychiatric examination of the defendant to explore her personality and its susceptibility to control under the circumstances of the case. However, an exploration of the general concept of non-liability for trafficking victims should also help in establishing further sympathy for the defendant. Doug’s ongoing consultations with lawyers retained to represent trafficking victims in criminal investigations is frustrating for him because the legal education here, unlike in the US, does not emphasize critical, logical, sequential, fact-based, argumentative thinking. Consequently, in translation, he cannot get the lawyer to focus on the facts of the case without scampering out on irrelevant non seqitor limbs which, he tells me, drives him nuts. Responding to your request for ideas for the next funding cycle, let me start by telling you about our visit earlier this week with Mr. Ingbodt, the Chief of the Human Trafficking Division of the State Investigation Office. The Division is newly created to focus on Trafficking in Persons (TIP) crimes and we went to inform him about the CHRD project and specifically the availability of trained and accredited advocates who are available to represent TIP victims at no cost. As an aside, I was surprised that NCAV (Nat’l Committee Against Violence) did not join us in this meeting. Our reception by Mr. Ingbodt was not warm, at least until he learned that we were not there to offer more trainings for his investigators. He said that he had been inundated with training offers from many NGOs and that, in his opinion, such trainings were now worthless and a waste of time. When he finally understood that we were offering to provide and fund advocates to represent victims, he said the Division welcomed the list, but he cautioned that he had received similar offers from 14 other donors. He identified The Asia Foundation, the International Labor Organization, and the International Organization of Migration, but declined to provide any other names, saying he would not be an “informer”. He did not seemed impressed when we emphasized that the advocates on our list had received extensive and accredited training on TIP ( trafficking in persons) law and advocacy procedures. He further advised that, while his office would include our advocates’ names on the list of advocates offered to victims, he could not advise us when one of our advocates was selected. I am relating this incident to emphasize that I can only make suggestions from the perspective of the volunteer attorney, not from the point of view of the NGO or the donor. The bête noir of volunteers, such as myself, is redundancy. It is demoralizing to find oneself in competition with other NGOs to provide the same or similar services to the same target population. This, of course, is not a problem that is unique to Mongolia or to legal volunteers, but seems to plague NGO work everywhere that I have been in the past ten years. It is also discouraging to find that NGOs show little ability to coordinate their work to avoid these duplications. The reality is that NGOs often must fashion their programs to the taste of the donors in their chase for funding. All this you undoubtedly know. This being said, there was a joint effort with the Swiss-funded project of the Human Security Policy and Research Center on the draft anti-trafficking law to hold a seminar for CHRD-trained (ed note Center for Human Rights and Development) advocates and government officials on the draft law. The seminar and resulting suggestions hopefully were useful and were followed up with a second small meeting with the Ministry of Justice and Home Affairs, which is shepherding the bill into the Khural (Parliament). I am also informed by Urna, of CHRD, that she is an active leader in the NGO Council in Ulaanbaatar. But I know nothing of its operations, other than that Urna was not optimistic about its impact on NGO coordination. Is it perhaps Utopian to think that there might be a conference among all international donors involved in TIP programs in Mongolia to coordinate their funding to reduce overlap? Since the NGOs here are donor-driven this is perhaps the only way to design an effective and economical attack on the TIP problem by the non-governmental sector. Although I, and my wife, have offered to assist in strategic planning, I have not been made privy to planning discussions at CHRD or NCAV, having been confined to the TIP projects in each organization. From my narrow perspective I have found the process of mentoring advocates handling TIP cases for the CHRD and NCAV to be fruitful, and not only in advancing the particular cases the advocates are handling, but also in improving their general advocacy skills. To the extent the NGOs are willing to continue, or even expand, their TIP projects, particularly the funding of advocates to represent victims and the training of new advocates in the intricacies of TIP law, I urge the ABA to seek new funding. However, as I mentioned in my email on Khovd, the division of responsibility (sexual vs labor exploitation, domestic vs cross-border, UB vs all of Mongolia) leave major gaps that are artificial (e.g., sexual exploitation is often a form of labor exploitation) and interfere in network operations. B has mentioned her interest in promoting the concept of pro bono work among advocates in Mongolia. This would seem to be a good idea given that the concept seems alien here. A preliminary search for larger law firms here which might be able to support pro bono work by their partners and associates has not been fruitful. So a project to proselytize among individual advocates, law firms, and the National Association of Mongolian Advocates might be useful. On another matter, a problem has arisen in two on-going cases handled by CHRD attorneys that is bound to repeat itself. Both cases involve minors trafficked to work in circuses abroad. The minors were recruited, in one case by a relative, in the other by a trusted teacher. The minors were exploited and abused. While they were abroad their parents sought assistance from CHRD. In one of the cases, the minor (now 17) is still abroad in a government shelter. She has made clear that she blames her parents for her treatment and refuses to communicate with them. In the other case, in which 4 families are involved, the family of the youngest victim (13 at the time of the events, and also deaf) has decided to apply to withdraw their complaint against the trafficker-teacher. The family may have reached a financial settlement with the trafficker, but, of course, a 13 year old is not legally permitted to work under any circumstances. Thus in both cases, the parents, initially seen as victims themselves, might be involved in the trafficking and, in the case of the 13 year old, not acting in the child’s best interest. Both cases present clear conflicts between the parents and the child victim. I have discussed this with all of the CHRD/NCAV attorneys and we agreed that the attorney representing the parents cannot also represent the child due to the conflicts. The Investigator will have to be advised and a separate attorney obtained for each of the two children. The problem is that CHRD is limited to funding a single attorney for each case and I am not aware of any state funding for victims’ attorneys. This problem of conflicts between parents and children (where the parents who consented to their child’s employment may be acting in league with the traffickers), or between different victims (where one or more victims might also be involved in the crime) is not uncommon in the Legal Aid context, often requiring a court-appointed attorney in a multi-defendant case to represent a defendant where Legal Aid is conflicted. I hope that, in future funding requests, ABA can provide funding for second, or even third, attorneys for a single case where this is required. What am I doing? The National Committee Against Violence (NCAV), where Doug works one day week, asked me to edit a progress report to their donor about NCAV’s shelter for abused children, primarily pre- and teen-aged girls sexually abused by a family member. After reading the report, I was sufficiently moved to mention to them my friend, Anita, who has spent her entire distinguished career as a child analyst, and suggested she might consult with them. Muggii, our English-speaking contact at NCAV, brought in the social worker who runs the shelter to meet me. She described some of their immediate problems: how to develop and implement a strategy for the child to re-enter the home, how to organize meetings between the parents and the child, how to prepare the neighborhood social worker to work with the parents both before and after the child leaves the shelter. I also learned that NCAV has just hired a newly-graduated full-time psychologist with little or no clinical experience. The 22-bed shelter can support children for up to three months. The state runs long-term child care centers for children whose parents cannot care for them because they are in jail or mentally ill, but provides no shelters or counseling for victims of abuse. After emailing the reports and explaining the situation to Anita, who readily agreed, we set up a date to talk over Skype – 9am UB time, 9pm Philadelphia time the previous day. The new psychologist was over the moon about consulting with a psychoanalyst in the US, and Muggii was clearly proud to be translating for such an important effort. They spoke for over an hour. They spoke about using anatomically correct soft dolls for the children to play out their experiences. Such dolls are unavailable in Mongolia, but the psychologist said they will make their own. Anita told me later that puppies’ tails also worked, so I will look for puppy dolls in children’s stores, as well as drawing materials for the children to relate their experiences through art. There will be further consultation once the psychologist has some particular cases to discuss, probably next week. Anita encouraged as much group discussion among the children as possible about what kind of parents they want to be and what kind of families they want to have, as well as encouraging facilitated discussion among the parents on positive discipline that the shelter is already engaging in. The need for volunteer staff psychologists was evident, and Anita suggested an international psychology intern and exploring what Doctors Without Borders could contribute. This is the most useful thing I’ve done here to date. Time for fun and photos! Manshir Khiid (Buddhist Monastery) Manshir and Terelj National Park are the two one-day excursions in driving distance of Ulaanbaatar, and since we’d already been to Terelj, when asked by Baljid and Gaalam, a couple we’d met hiking, where we’d like to go one weekend, we suggested Manshir. At 1645 meters, the Manshir monastery once held a commanding view of the surrounding forested countryside, and was home to 350 monks, until it was destroyed by Stalin’s thugs in 1937 as part of his crackdown on religion. 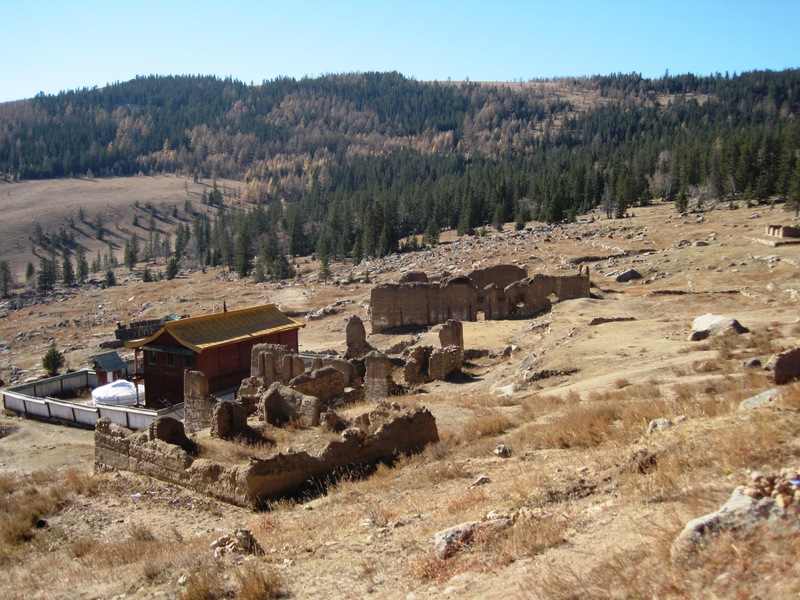 The main temple, restored and converted into a museum, contains photos of the monastery from the 1920s taken by a German tourist, and interesting tsam masks worn by lamas during religious dance ceremonies, but the remaining temple buildings remain in ruins. Upon entering the grounds, we saw a huge bronze caldrin, from 1726, reputedly large enough to boil 10 sheep at a time, presumably enough for an afternoon’s mutton snack! 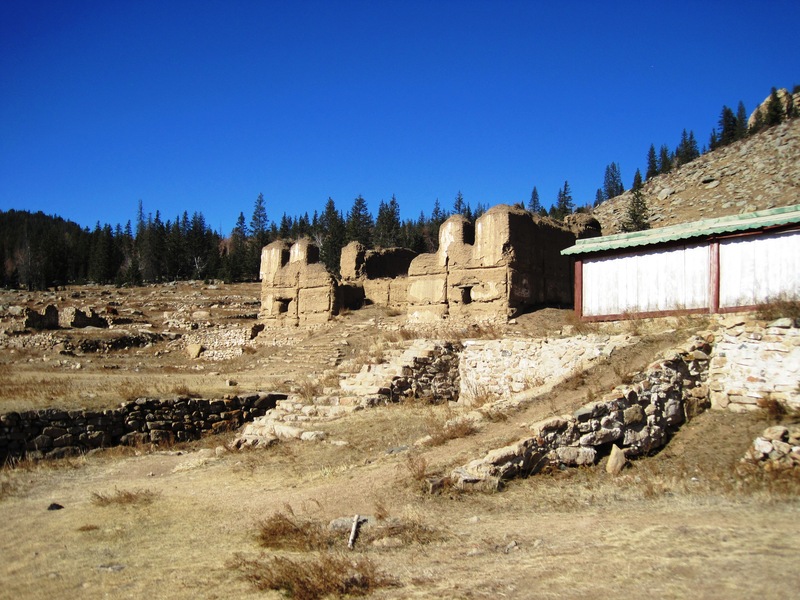 Below are the Manshir Monastery ruins. Galaa was carrying a heavy pack, and when we stopped we saw why. He took out a thermos of hot water, plus coffee and tea and snacks. 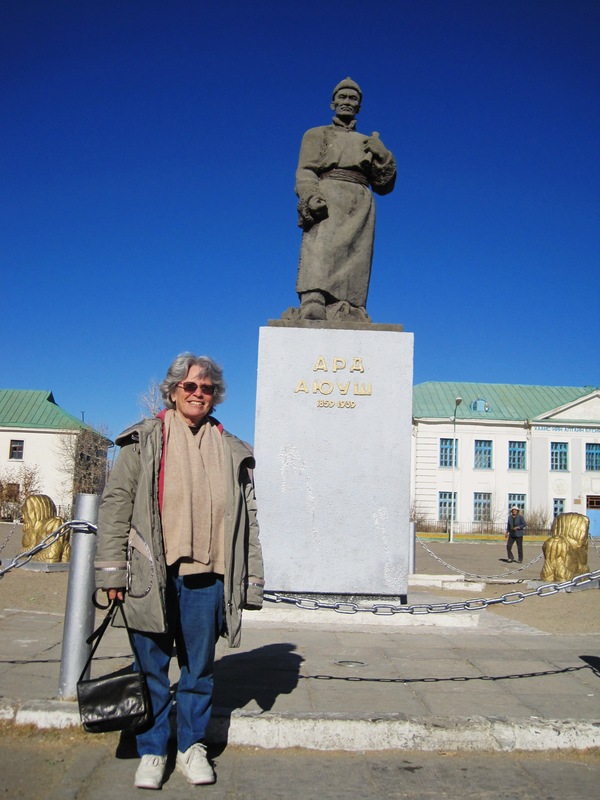 Baljid works for the Open Society Forum, and Galaa teaches Physics at the Mongolian State University. Here we are snacking on the hillside. Later, on the way back to UB, we ate lunch at a Korean restaurant whose spicy food was a nice change from the generally bland Mongolian diet. Another view of the ruined monastery, from below. and influence for ambitious young men. The Buddhists quickly banned Shamanism and, after Manchuria conquered Mongolia, the Manchus gave feudal power to the lamas in return for their acting as surrogates to control the population, thus creating a powerful feudal society, with the best land and livestock under their control and many herders working for them as serfs. 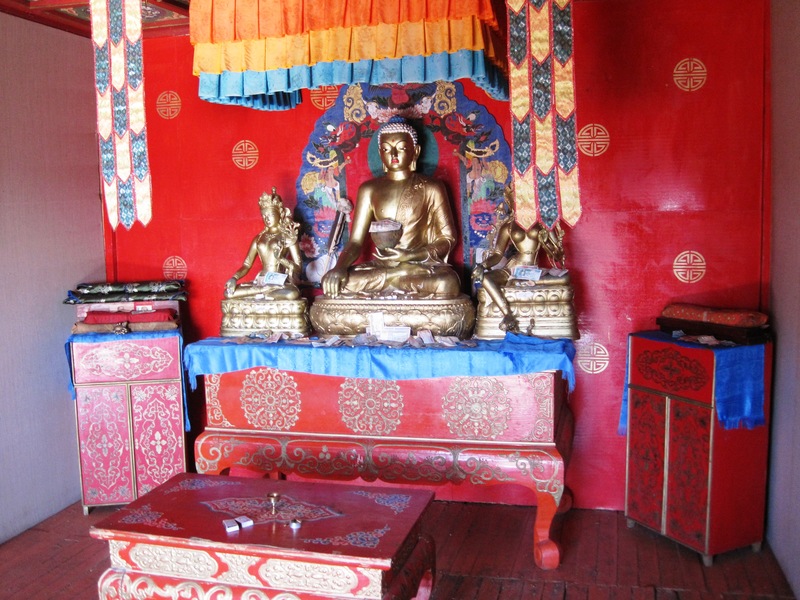 Buddhism and Shamanism were officially outlawed by the communists in 1921; however, shamanism’s roots, going deeper than Buddhism’s, continued to be practiced in secret. 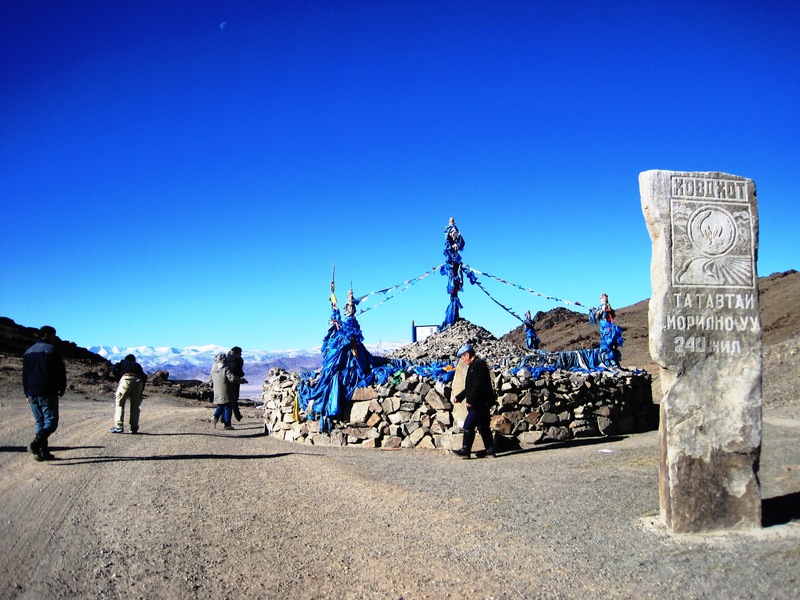 The ubiquitous cairns of stone swathed in sky-blue cloth (ovoos) attest to the continuing influence of shamanism in modern Mongolia. After the successful Japanese invasion of Manchuria (which borders Mongolia) in 1937, Stalin decreed that the lamas who had survived earlier purges must be Japanese agents, and what followed was the mass liquidation of lamas and razing to the ground of all but one monastery. 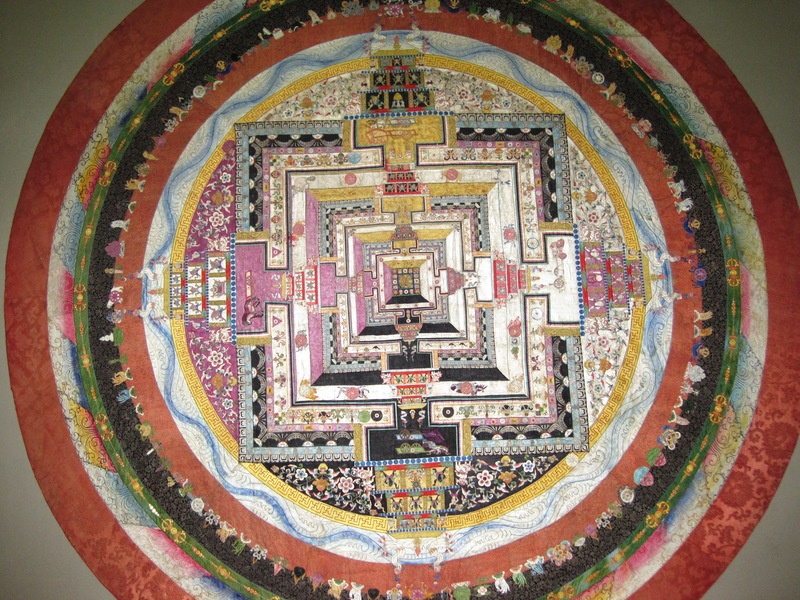 This mandala in the Zanabazar museum is made of cloth. 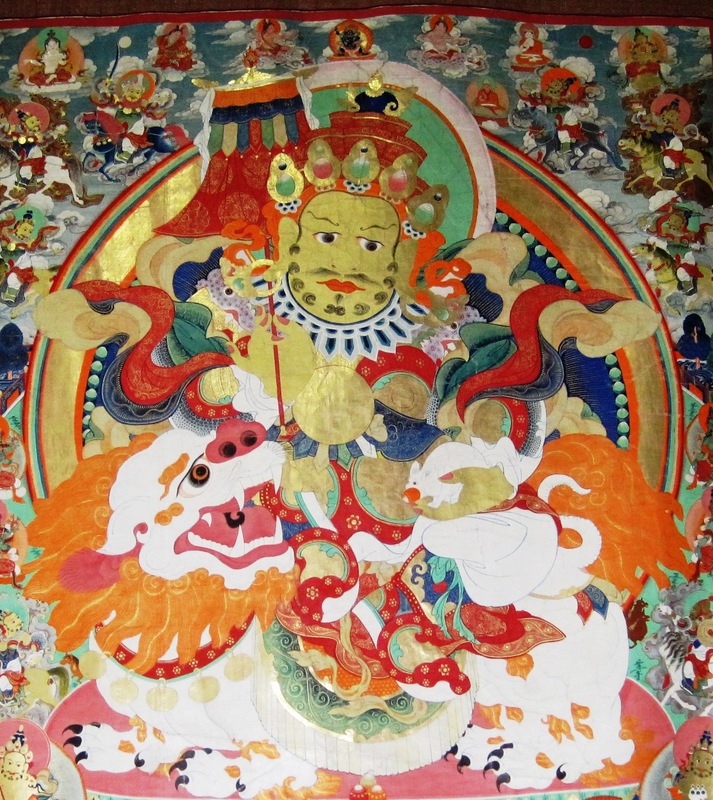 Below, another work from Zanabazar. Hovd network workshop 10-27-10, 10-28-10 We were excited about our trip to Khovd in western Mongolia, to meet with an anti-trafficking network established two years ago by the ABA. 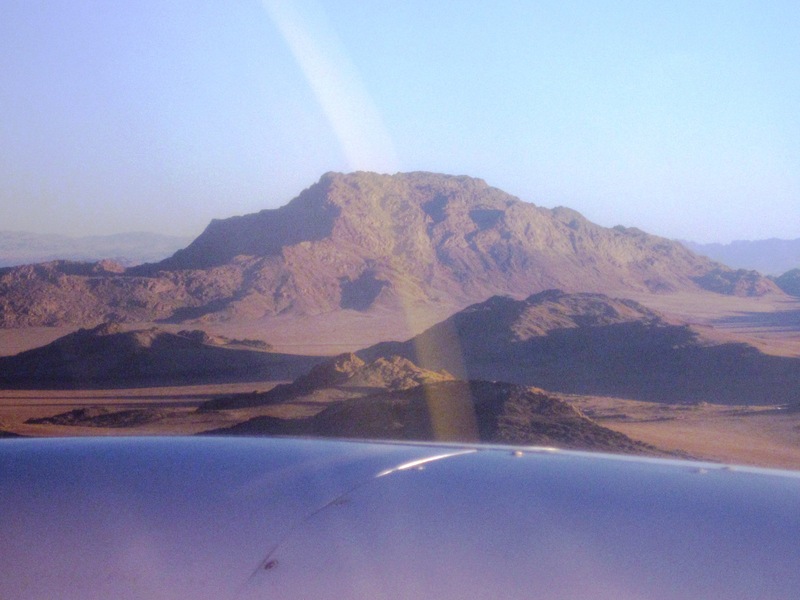 Arriving in Khovd aimag (province and city) airport, a 2.5 hour flight from UB, about 10am, we, Bayaara, the ABA’s Mongolian country director, and Amraa, CHRD’s anti-trafficking coordinator, were met by the legal aid unit head, her lawyer assistant, and their driver. After depositing our bags at the hotel, we walked across the road to a building where several network members were already waiting for the session to start. 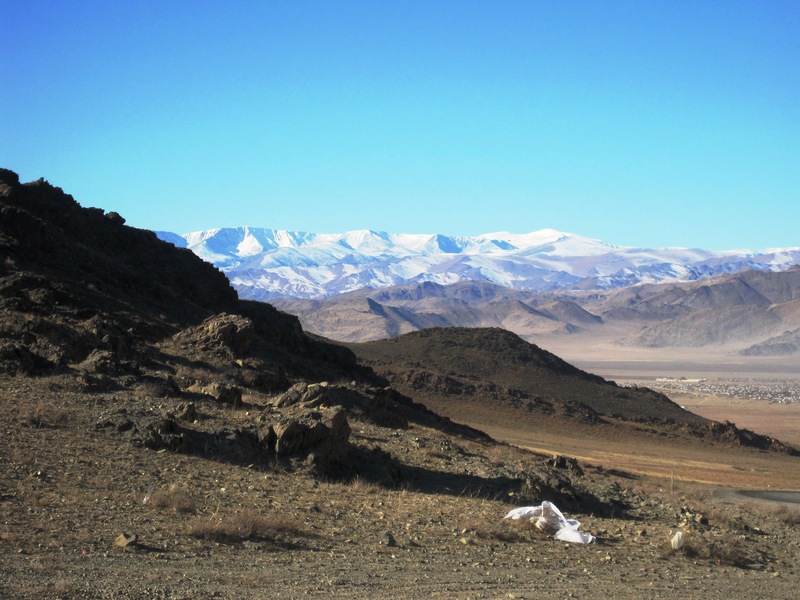 With the help of the ABA and CHRD, Khovd aimag, in Western Mongolia, had successfully formed a network of anti-trafficking specialists, including lawyers, judges, police, prosecutors, social workers, and investigators (from the local child protection agency and the national trafficking intelligence unit investigating cross-border cases). To date (after two years of existence) they had not brought a case to trial. Doug discovered 1) that they were unclear as to the definition of trafficking (recruiting or transport of persons for the purpose of exploitation and personal gain for the trafficker) and how it differs from labor and sexual exploitation, fraud, and breach of contract, although the goal of trafficking usually also includes these violations, and 2) that the network lacked an understanding of who would/could do what when a trafficking crime was suspected, suggesting the need for a memorandum of understanding (MOU) among the members spelling out an operational protocol. With considerable difficulty, after exploring all the cases they knew about that might qualify as trafficking, they settled on two to start with, with commitments from the members to get the ball rolling. As to the memorandum, some bureaucratic obstacles were tossed about by the chief of criminal intelligence, who said he needed permission from his boss in UB (which was dealt with the next day when we visited the Chief of Police in Khovd). The participants promised they would draft the MOU themselves, because they understood what was needed. And so the two-day Khovd anti-trafficking network workshop came to an end. After lunch the first day I went shopping with Bayaara at the local market. 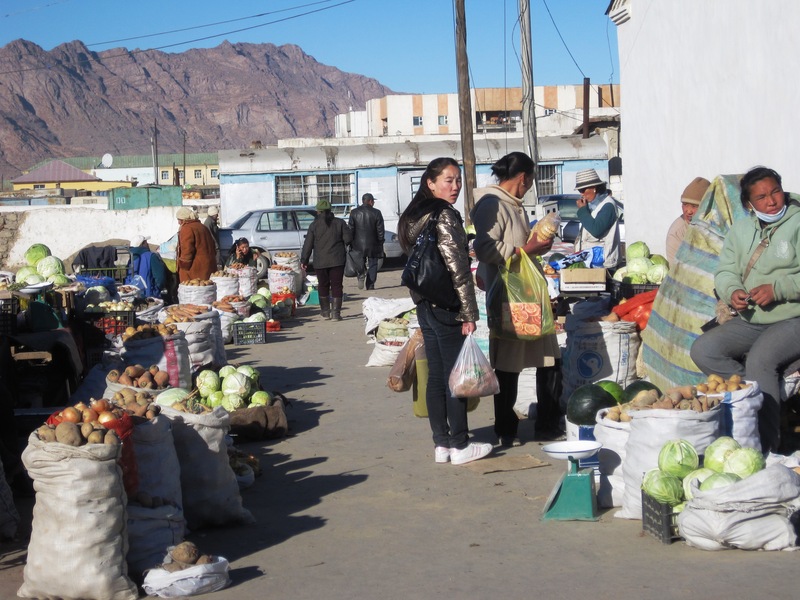 Khovd is known for its small watermelons, and Bayaara wanted one, but wasn’t sure how to select one. All I could remember was to rap it with my knuckles, and it if sounded hollow, it was ok. I don’t remember where I heard this, but it seemed plausible. So we knocked on a few melons as if we expected an answer, while the bemused vendor looked on, but they all sounded the same. Finally, I asked her to sniff the melon she had chosen to rap, and if it smelled sweet, to just get it, which she did. 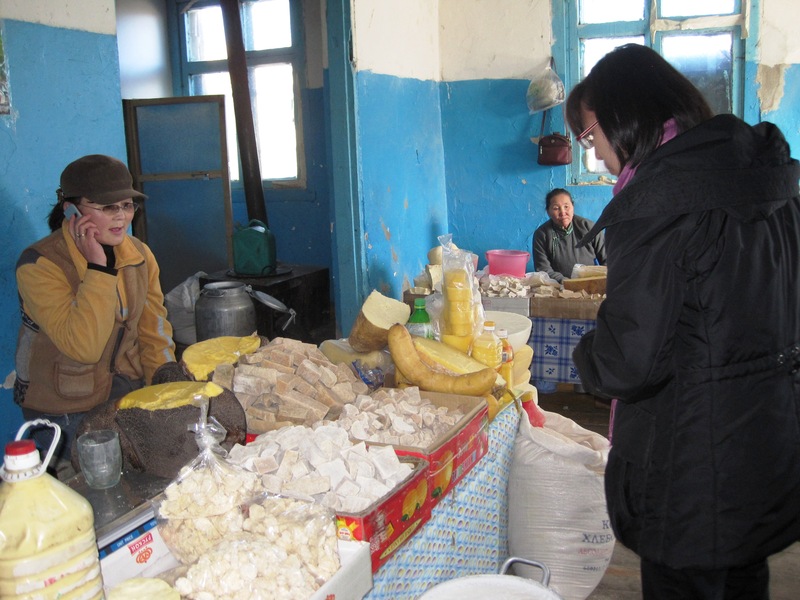 Next, she wanted dairy products, which she believed would be more organic and healthier here than what she could find in UB. Inside the dairy building a vendor offered us camel’s milk, which was thin and slightly tangy, slightly “off”. Not wanting to offend, I said it was an unusual taste for me, and, to my surprise, Bayaara replied that it was an unusual taste for her, too. She thanked the vendor for the taste and we moved on. I bought some curds, which I like, and something that looked like cottage cheese, but wasn’t, and Bayaara loaded up on other things, and we ended up splitting the bag of curds. The workshop photos from day 1. Here are two videos of participants speaking at the workshop. I thought it might be interesting for you to hear Mongolian spoken . The conference room looked out on the town square. 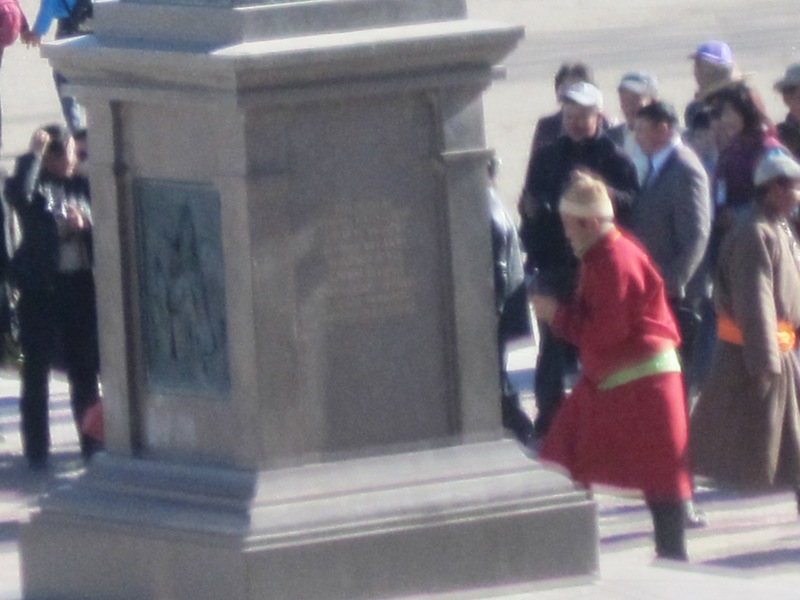 There was a conference in town of master herdsmen, and several were posing in their native dels for photos around the main statue, of Galdan Boshigt (1644-97) ruler of the Zuungar Mongols, whose military victories in Central Asia gave him brief rule over the silk road cities Samarkand and Bukhara. That evening, we joined the visiting master herdsmen for a performance in their honor (this was not a performance for tourists). I recorded video snippets of the dancing, singing, and instrumental performances. I especially love the morin khuur, the two-stringed, bowed, horsehead fiddle. (If you look at only one of the videos, please see that one. I’ve starred it below. Doug thinks there’s too much here, so you may want to watch a few then come back for more later). The dancing was also intriguing because one of the performances had a decidedly Arabic influence, perhaps from neighboring Moslem Khazakstan (and the minority Khazak people who live in western Mongolia), but it’s a mystery. Each performance represents a different minority group in the area, of which there are many. Amraa mentioned the name of each but I wasn’t able to record the information, sorry. I’m glad we had the chance to see and record snippets of these performances. The herders seemed to enjoy them also. After the performance, we met the 7 local Peace Corps volunteers (PCVs) stationed in Khovd for dinner. It was like meeting old friends with whom no explanations are needed; the PCVs understood exactly what we were talking about, as did we understand them. 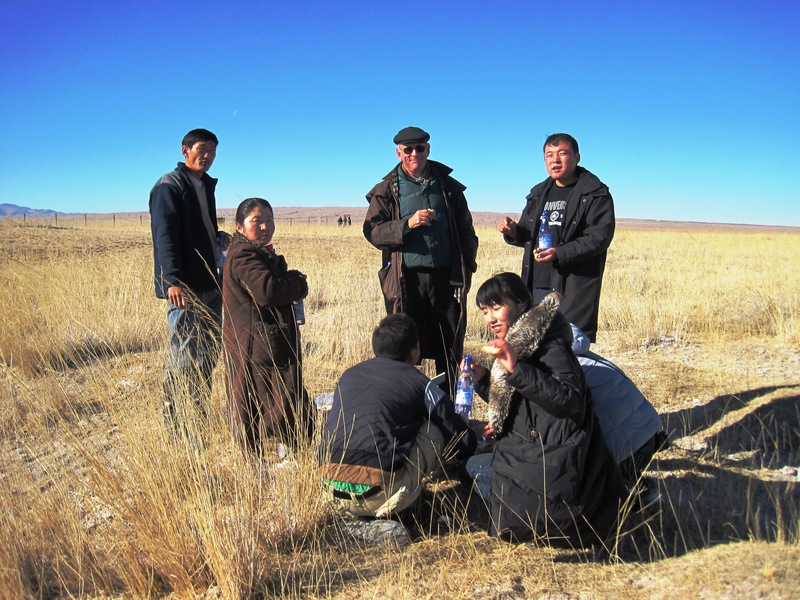 Mongolia is different from the standard model of one Volunteer per site because there’s such a small population and consequently a small number of municipal units having something for a volunteer to do. 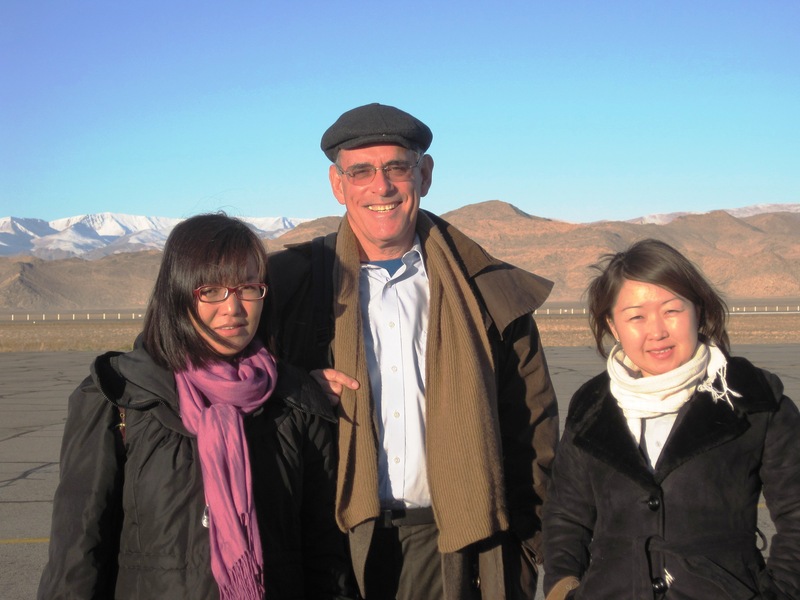 In Khovd, most taught English in the public schools; one worked in the public library and taught English classes in the evening to disadvantaged youth; one with a background in human biology, worked for the public health department; one, in community economic development, found most of his work in his secondary projects of helping a minority Khazak woman start a tour business (Khovd is a major airline destination for western Mongolia) and another open a souvenir shop. The PCVs all seemed motivated and content. 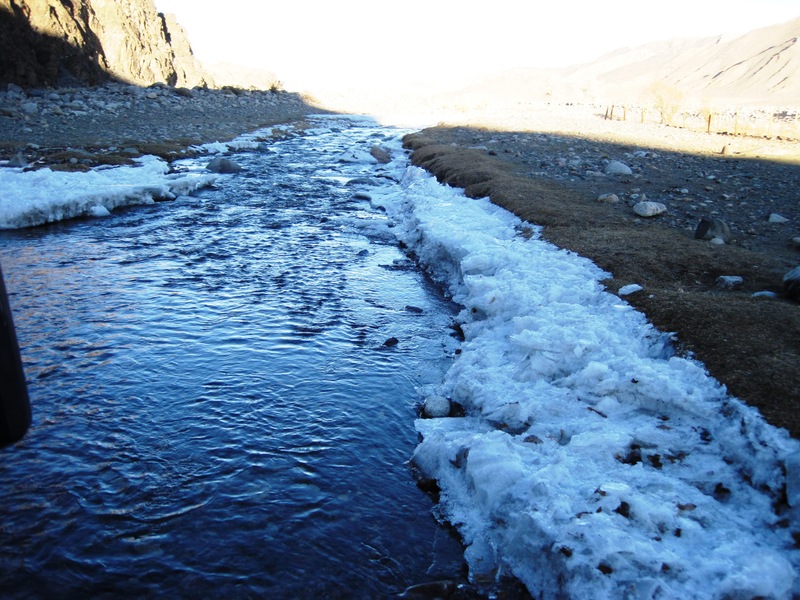 Only one had lived in Khovd through the previous winter, which she described as “rough”. They all thought they had enough money from Peace Corps to live comfortably, unlike the PCVs we’d met in Azerbaijan, who said they were just getting by. The next day, Friday, was devoted to courtesy calls to the chief judge, the chief prosecutor, and the chief of police, with Amraa, who, though still sick, gamely kept up her end of things, and the same network lawyer who’d met us at the airport came along to show us the route and to attend a court hearing that morning in the same building. Next, we visited the chief prosecutor, a young man who listened carefully when Doug suggested that trafficking complaints go to both the police and the prosecutor’s office so that the prosecutor would know about complaints filed, even when the police did not investigate, claiming insufficient evidence. Doug suggested that a single police officer and a single prosecutor be designated to receive trafficking complaints. He wanted the police to tell the victim- complainant and her attorney or representative what else was needed for the police to start an investigation, because we’d heard from social workers that they never had enough evidence for the police to get started. The chief prosecutor said he had no control over the police, but agreed with the plan and supported the network. He said he was very much in favor of working out a method of sharing information which could be shared legally among network members, and being made aware of trafficking complaints when they were brought in to the police, and possibly starting investigations which the police might not start due to lack of evidence. Finally, the police chief, who also concurred with the network’s objectives, and with the idea of copying the prosecutor with complaints made to the police, even if there was not enough evidence to start an investigation. He also agreed that when the police decided they did not have enough to start an investigation, they tell the person bringing the complaint what further information was needed, and that yes, he could designate someone to handle trafficking complaints. As to the chief of criminal intelligence on his staff, he did report to two bosses. When Doug asked if the chief could authorize him to deal with negotiating an MOU in Khovd, the chief said yes, and Doug asked that he personally authorize him so he knew he could work with the network on the MOU. The chief smiled obligingly, acknowledging the universality of hierarchical practices, and said he would. All three were agreeable diplomats; we hope something actually happens. That afternoon, Amraa bowed out and went to bed with her flu. The hotel rooms were not warm, and the water only lukewarm. She had changed her room to across the hall from us, hoping the room would be warmer, which it wasn’t. It had the advantage of allowing us to look in on her easily. The lawyer who had sat in on our meeting with the chief judge for a short time that morning called the local doctor, who made a hotel call, said it was nothing serious, and prescribed sleeping pills and stronger pills to dry up the cold. 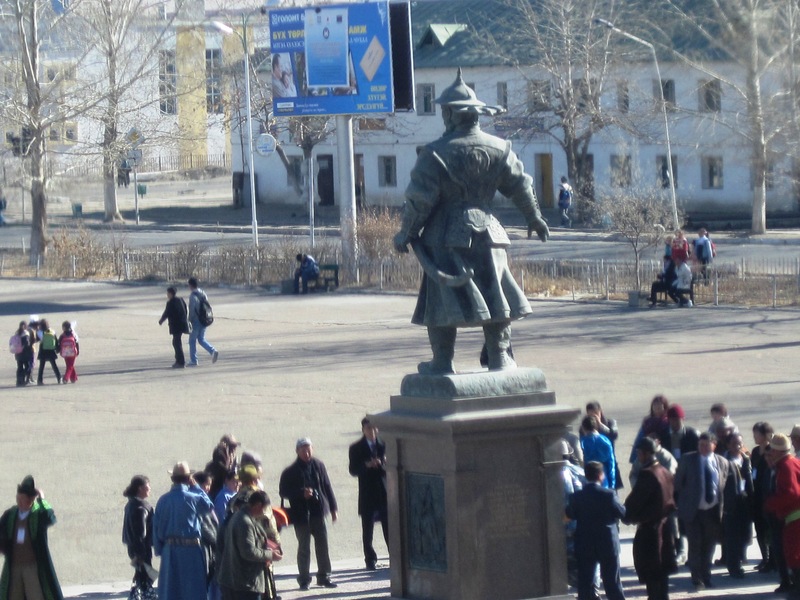 We’ve found Mongolians to be generally content with their health care system. While Amraa slept, the lawyer and the municipal legal office’s driver took us to the local museum, which displayed copies of Paleolithic era drawings of reindeer, hunters, and other animals found in caves not far from the city (which we would see the next day), and to the Sangiin Kherem (Manchu Ruins) built around 1762 by the Manchu (Qing) dynasty warlords who once conquered and brutally governed Mongolia. The 1500 man garrison was destroyed after a 10-day siege and 2-day battle in August, 1912. The remaining Chinese legacy in Khovd are the tree-lined streets in this section of town, around the compound. 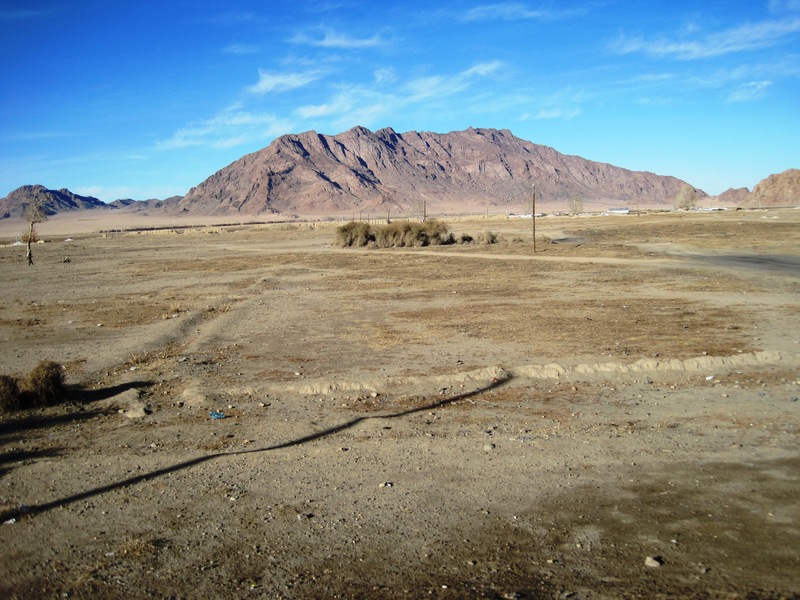 This is all that’s left of the once-mighty Manchu settlement. After seeing the ruins, we drove to the other end of town, towards the airport, to see the new Buddhist temple that had just opened three months earlier. Each stupa around the second level contained a plaque with the donor’s name. Our driver seemed to know many of the people, so he found the excursion interesting. The lawyer developed a case of hiccups and burps, which seemed to be causing her distress. I motioned to her to raise her arms while I whacked her on the back several times, a time-honored technique I’d grown up with, but it didn’t work. She continued her intestinal and respiratory distress for the remainder of the walk around the temple and all the way back into town. On Saturday, the hoped-for excursion materialized; the vague and changing composition of participants and vehicle remained amorphous until two people showed up at the hotel, and we boarded a van holding about 8 persons. We stopped at the other end of town to pick up the others, making a total of 5, plus us and the driver. We stopped at a market to buy drinks and food for lunch and snacks. 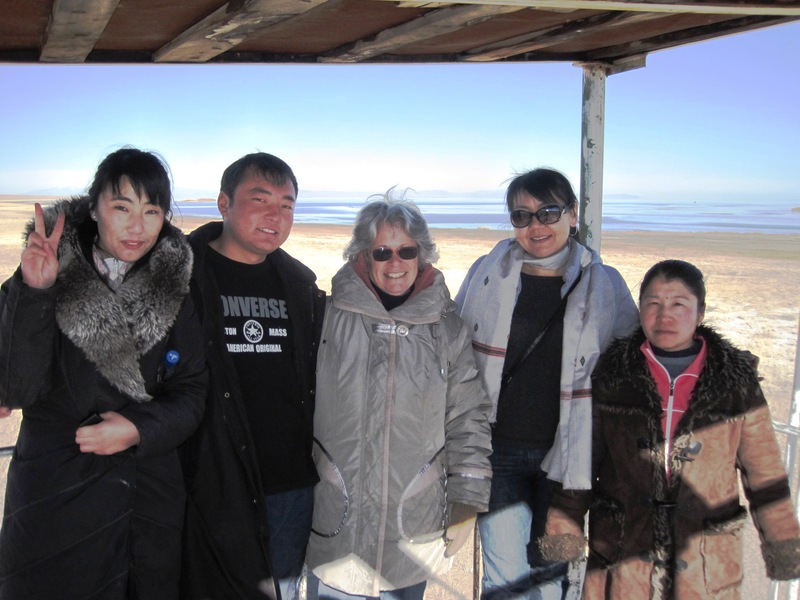 The English level of this group was rudimentary, so we relied a lot on our Lonely Planet Mongolian Phrasebook and Guide to Mongolia for information about where we were going and basic conversation. 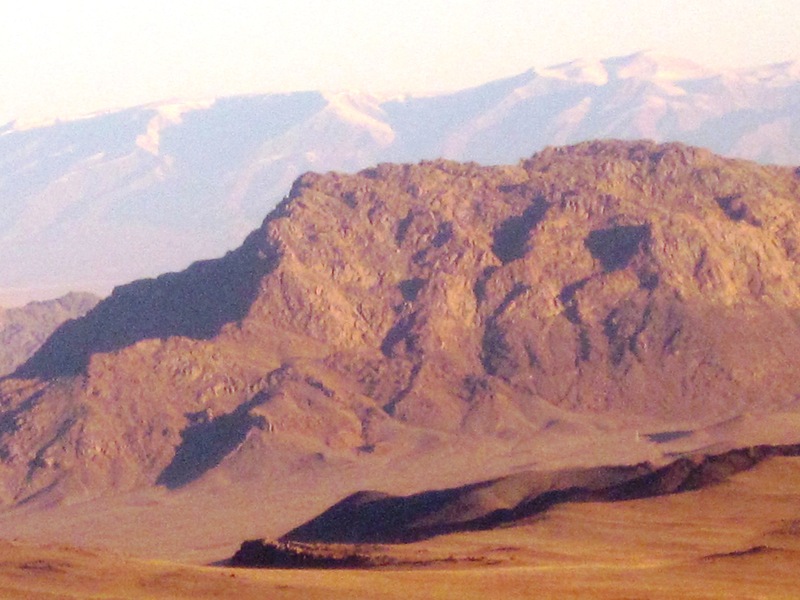 and when we stopped at an ovoo (pronounced owoo), a shamanistic cairn, we were quite high up (notice Khovd in the valley to the right). 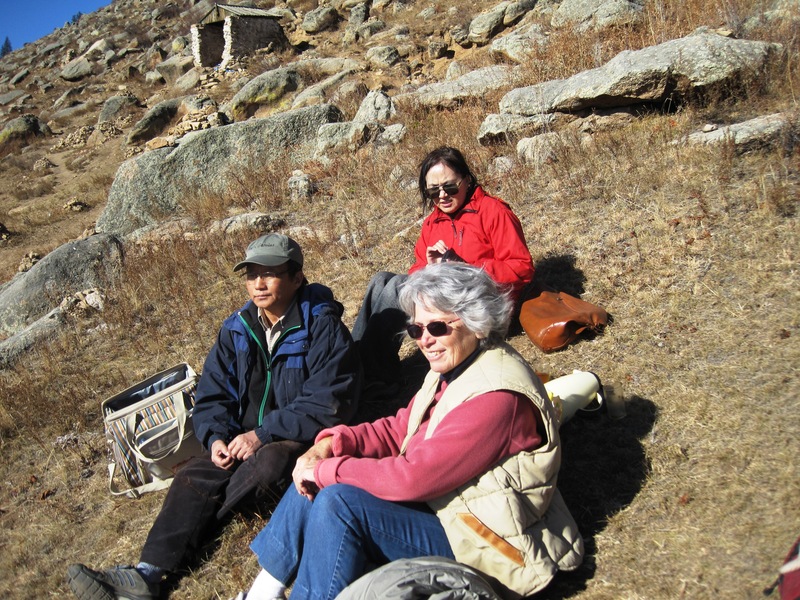 Our companions picked up a few small stones as they approached the ovoo, and as they circled around it 3 times, threw the pebbles onto the heap. Bimba, who had organized the trip, poured a glass of milk as an offering, then sprinkled some of it into the air, symbolically asking for a safe trip. Then vodka was poured and offered to me, so I put it onto the offerings’ altar along with the flowers, food, small bills, and other items. Apparently that was too much of an offering, because Bimba took the vodka back and suggested I could sprinkle some on my forehead as an offering, which I did. The rest of the cup was passed around and sipped. Mongolians we’ve been with either stop at ovoos, or honk their horns to show respect as they pass by (as Gaala did when driving to Manshir), but no one we know has ever spoken of attending a Buddhist temple service. All offerings taken care of, we can be on our way knowing spirits are looking out for us! 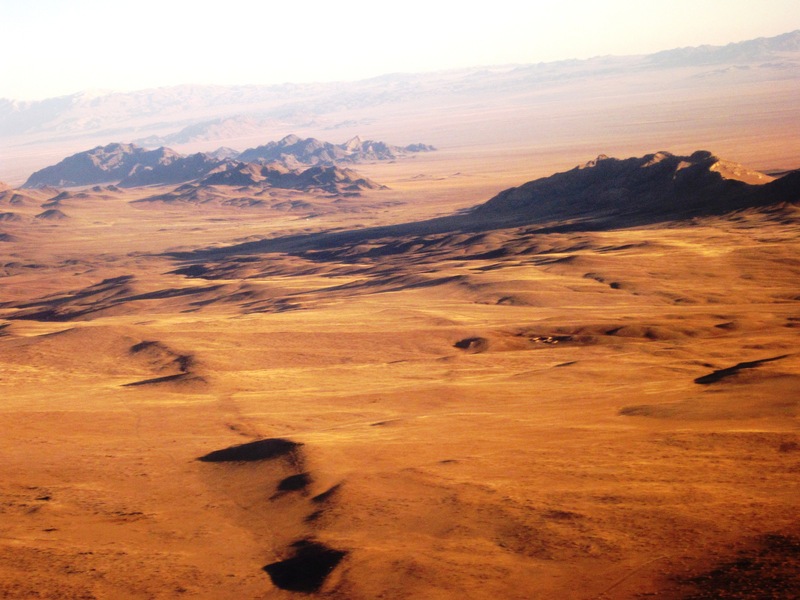 There are no paved roads linking cities in Mongolia. Once outside Khovd, and past the ovoo, we traveled along criss-crossed cattle paths; as we passed soums (settlements smaller than cities, about 2000 people ) and bags (smaller yet) and eventually got into dry, desert-like terrain, we realized that we would get lost very easily without a local driver. The first soum we passed was described as a Khazak settlement (we were close to Khazakstan); then, at a bag, the driver got out to say hello to his family. 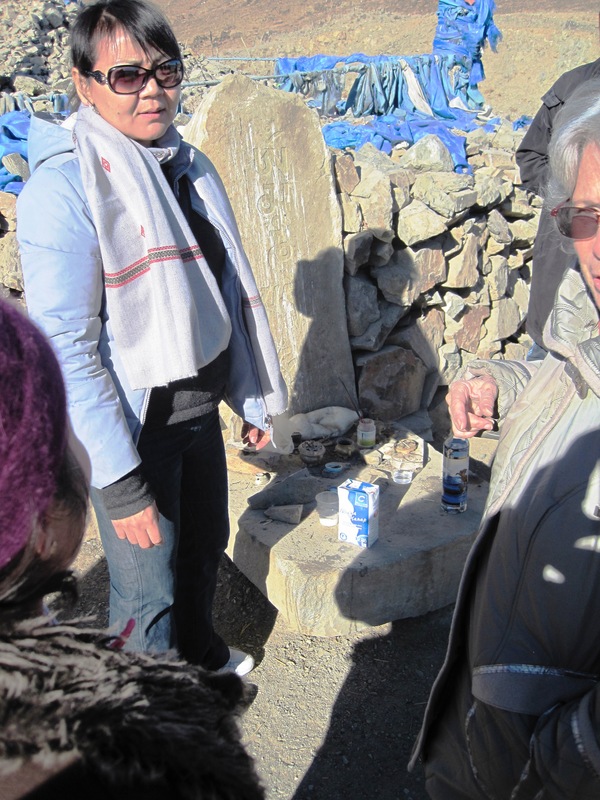 Later, we stopped for directions at a bag, consisting of a few gers and a few buildings, and then again at a ger camp, belonging to relatives of the child protection agency investigator, to which we would later return for dinner, although we didn’t know it at the time. 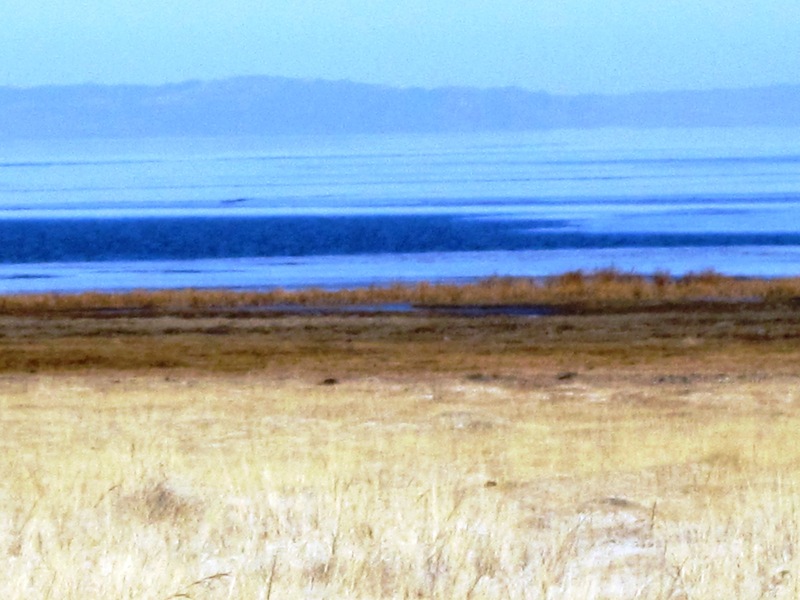 Khar US Nuur (Dark Water Lake), the second largest fresh-water lake in Mongolia, is expansive and lovely, with a marsh delta sheltering many species of waterfowl, which we were too late in the season to see. We climbed an iron tower to look around. Then, we had lunch, spreading out everything on the ground. There were a few gers at the lake, behind a stone wall, which we could see from the tower. 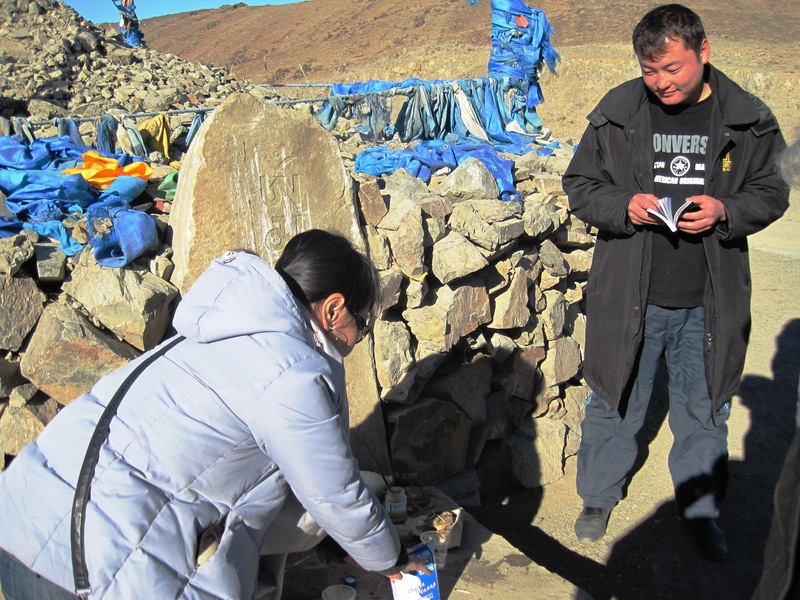 The wall represents an effort to protect animals during the winter months, now being financed by the government and international NGOs, in response to the loss of nearly half the livestock of Mongolia last winter. After we were underway for awhile, we stopped for tea and biscuits in a very plain shack. Afterwards, when I inquired whether another little shack was the toilet, one of the fellows turned me around and pointed to the field where three women were squatting with their skirts decorously arranged around themselves. I joined them. Eating lunch of bread spread with Mongolian liverwurst and other delicacies. 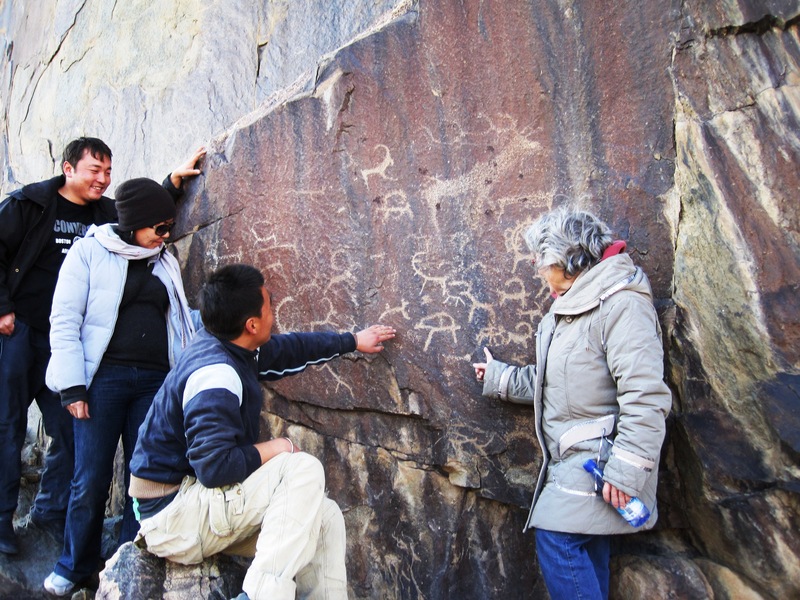 we arrived at Tsenkheriin Agui, home to some 15,000 year old cave paintings until vandals wrecked all but a few of them recently. We had already seen some reproductions in the Khovd Museum. The climb up to the cave was strenuous (it’s located in that dark area of the mountain). When we arrived, we found workmen digging a walkway down into the cave, presumably for tourists. The entrance and walkway were filled with scree and loose earth. I declared it too dangerous for us, and Doug agreed, but most, though not all, of the others went ahead, lighting their way with flashlights. When they returned they were covered in dust and breathing hard (I forgot to mention the foul air at the cave entrance). They said they’d seen some paintings. After sharing vodka with the workmen, we drove to another site to see more drawings, easier to reach. 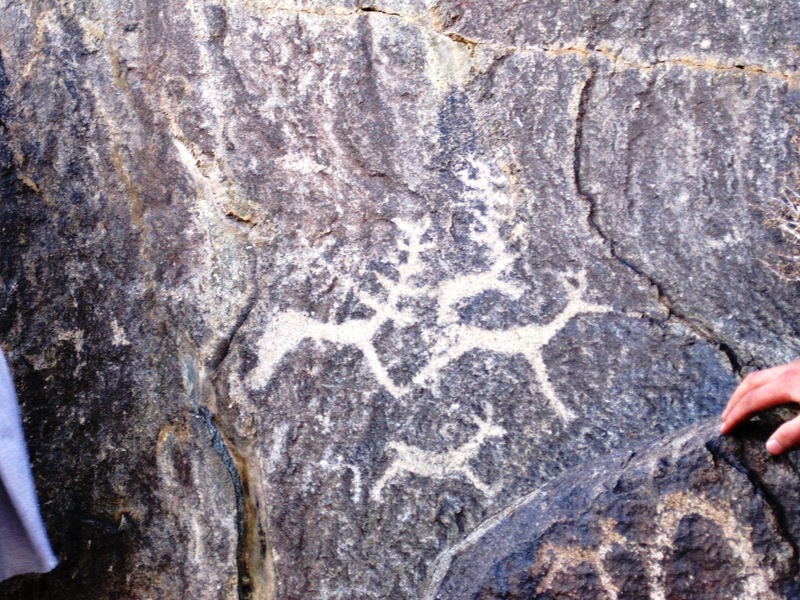 Reindeer figured prominently in these rock drawings. We drove back to the ger camp we’d stopped at earlier as the sun started sinking. We knew how to enter the ger and where to sit from our Ger-to-Ger orientation. The meal started with milk tea, followed by a delicious mutton-flavored noodle soup, then boiled mutton ribs so tender they tasted like lamb. We each took a bone covered with meat to eat and to gnaw; then one of our male travel companions cut slabs of meat off and handed them around. We figured out which of our male companions was the relative because he was handed a baby to hold! 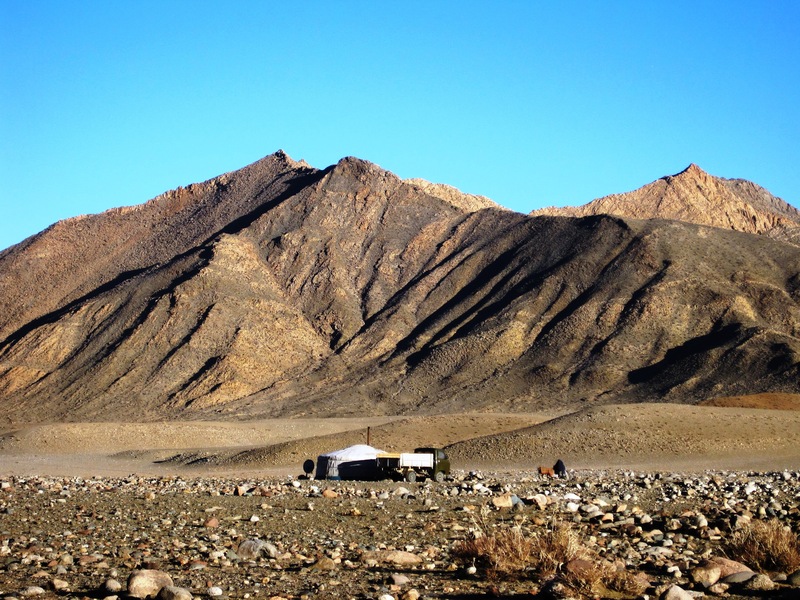 It was the best meal we’ve had in Mongolia! 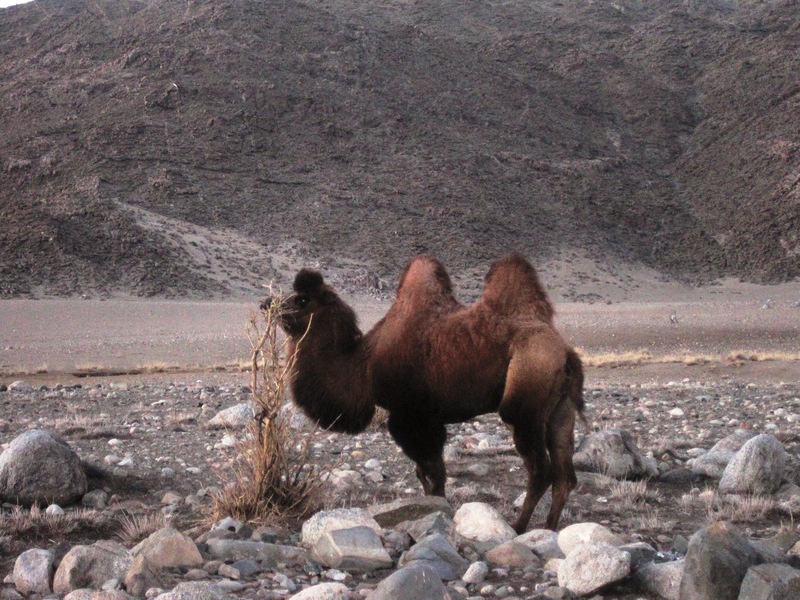 Outside, the family camel stood serenely taking in the activity. I was asked if I wanted to ride, which was kind of them, but I declined, deciding it was not a good idea to ride a camel on a full stomach. The two fellows rode the camel, having fun. The women walked away from the camp, behind some bushes, where I joined them, wondering what this would be like when it really got cold. Finally, it was time to leave as it was growing quite dark. Our driver had to back up and find our path only once, which, given the criss-crossing nature of the dirt paths, was an accomplishment. When we returned to Khovd, we asked to get out at the government building, because Amraa, now more-or-less recovered, was taking her online test as part of her application for a fellowship in the US and had texted Doug that, if we weren’t too tired, could we stop by the legal office, where she’d arranged to have a computer with internet set up. She’d finished one of her essays when we arrived, and was working on the other two. Of course we looked them over… She’s now progressed to the verbal interview stage, which was done over Skype. The lawyer who’d shown us around stopped in to lock up the office with her husband or boyfriend, so when Amraa finished we all walked back to our hotel feeling we’d had a memorable day. The Fantastiks and my fantastic lesson on the Morin Khuur We’d purchased tickets for the Fantastiks, the longest-running musical ever, put on here by amateur ex-pats and a few pros. Produced by Brigitte, of Sacher’s café, and directed by Sharon, wife of the Canadian ambassador, the show’s musical accompaniment of a piano, Mongolian morin khuur and zither, was unique! The actors and singers were local expats, with a few pros keeping it all together. Before going into the auditorium, we stopped to chat with the Canadian ambassador, who was collecting tickets, and at a calligrapher’s table, whom we asked to write our names in Mongolian script. We selected the mats we liked, and he said he’d have them ready when the show was over. Next to him sat a man with some CDs whom we didn’t pay too much attention to at the time. 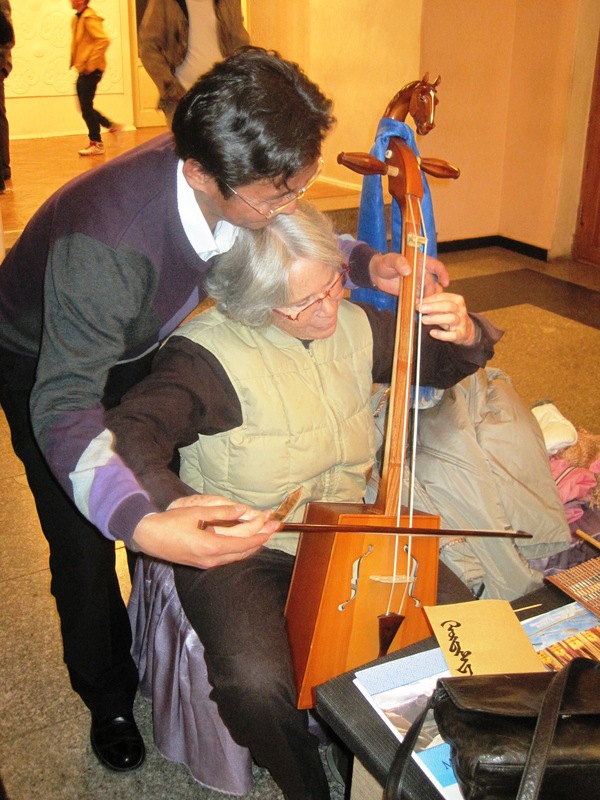 After the performance, which we thoroughly enjoyed, we went to pick up our calligraphies, and noticed the man was now playing the morin khuur, the horsehead fiddle. I looked at his CD again, and decided to buy one, which made him very happy. Asking the calligrapher to translate, I said in exchange I would like a lesson on the morin khuur. The fellow obliged. It is a difficult instrument to play, because it is mainly played using harmonics, not pressing your fingers to the fingerboard, because the strings are strung too high off the fingerboard. I got the gist of the instrument, at least. 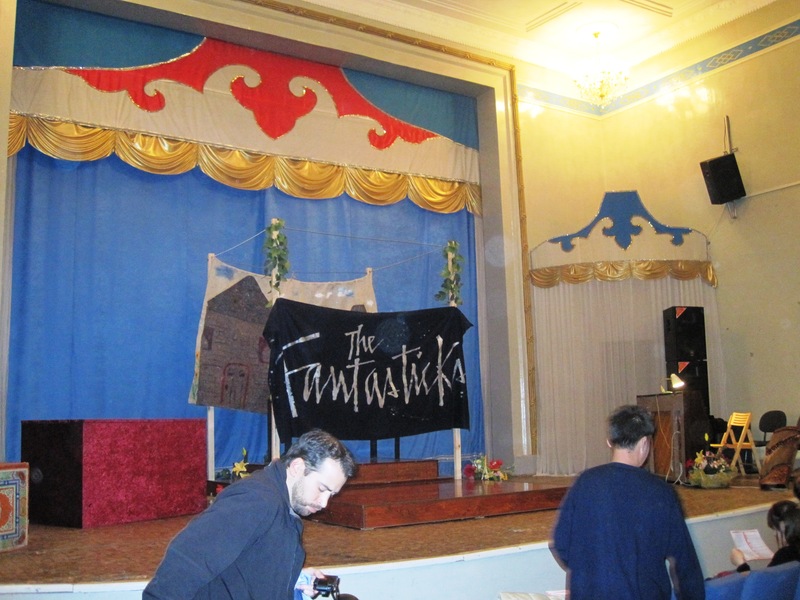 Here’s the Fantastiks opening scene! And that’s the news from Ulaanbaatar!